The BlackGold with Rings Cremation Urn is made of solid brass with a hand-etched design over all the urn, accented with three elegant eternity rings. The urn is top-loading with a threaded lid that permits a secure closure. A felt base protects furnishings. A velvet box is included that can be used for storage or transportation. A matching keepsake is available under our Keepsakes category. 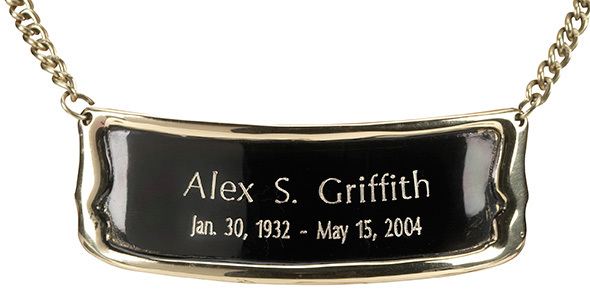 An optional Large Bright Brass Medallion Name Plate on a chain may be purchased to personalize the urn. Please limit engraving to no more than 26 spaces for the name and no more than 33 spaces for the dates or sentiment. 10.75" x 6" - holds 202 Cubic Inches which is large enough for most adults with healthy weights less than 200 pounds.